Well be prepared… everything’s about to change. Yep that’s right — you don’t have to seek out any more store-bought granola bars because these are the real deal. 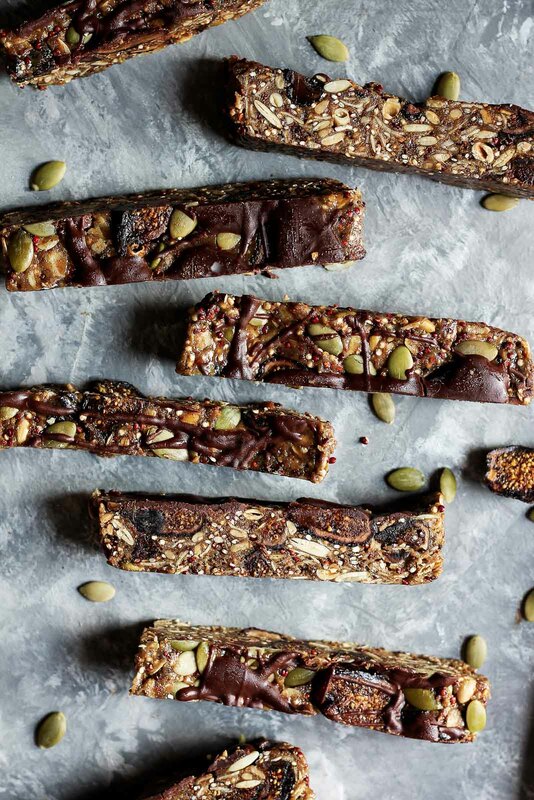 Chewy, slightly crunchy, gluten free & packed with fruit, nutritious seeds and whole grains — these nut free granola bars are about to become your (or your little one’s) favorite snack. Here’s how the story goes: I was strollin’ through the grocery store and suddenly realized I had sunflower seed butter leftover from when I made my allergy friendly chocolate zucchini bread (so good!). Then the reader survey came to mind; right then and there my brain went on a creative mission to make the best nut free granola bars ever. Immediately, I headed to the bulk section of the store to fill up on pumpkin seeds, sunflower seeds, quinoa and dried figs. A little something different then the usual ingredients! I headed home, both determined and deliriously excited to whip these up. This recipe is based off my peanut butter quinoa granola bars, but just adjusted things a little here and there. Reducing the oats in the recipe and adding in fiber-packed flaxseed meal, both sunflower and pumpkin seeds & a little chewiness from dried figs. They came out absolutely perfect. I know this because my boyfriend ate three bars in one night. He also claims he doesn’t like bars, so there you go. 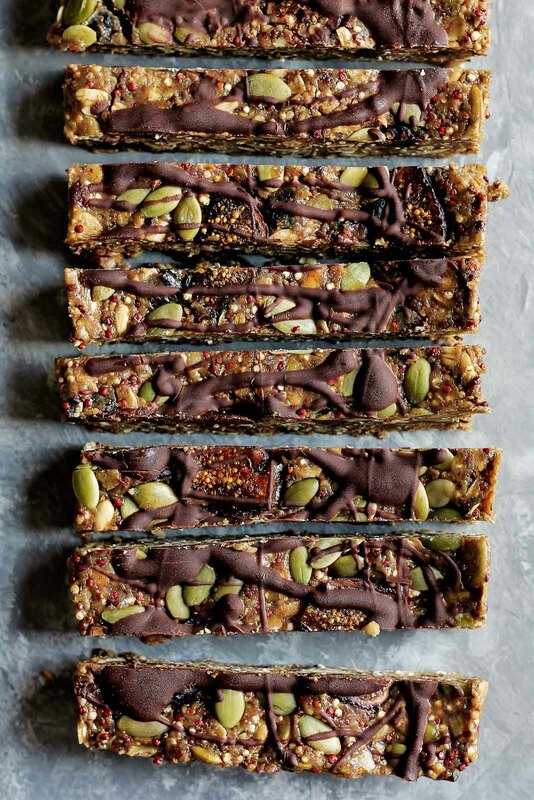 These truly are superfood bars — with pumpkin seeds, sunflower seeds, flax, chia, quinoa and oats! It’s the perfect energy bar! 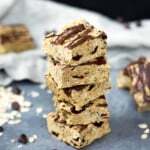 This recipe is allergy friendly — just make sure you are using gluten free oats and vegan chocolate if you are making it for someone with an allergy. 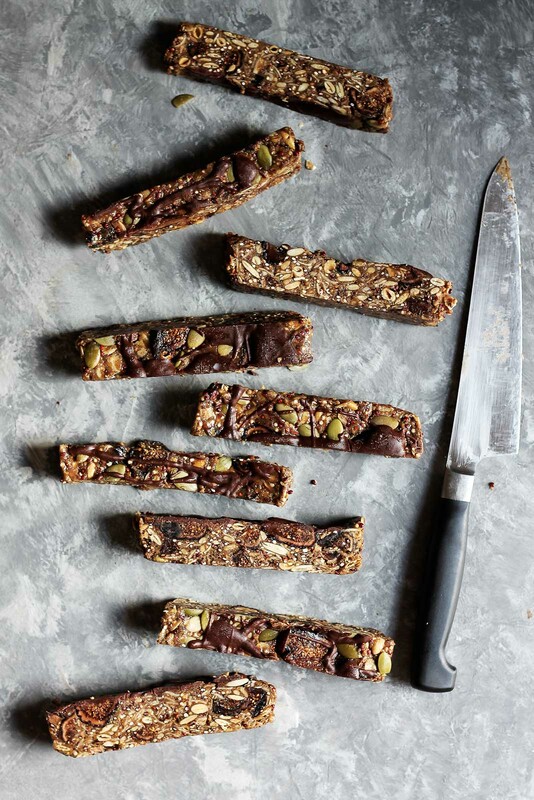 The bars are soft and chewy with a little hint of crunch from the quinoa & seeds. These bars are basically no bake! All you have to do is toast the quinoa, oats & seeds. Hope you love these bars as much as I loved making them. Keep the requests coming — it inspires me to create fun goodies for you. If you make this recipe, I’d love to see a photo! Snap a pic, upload it to instagram and tag #ambitiouskitchen! 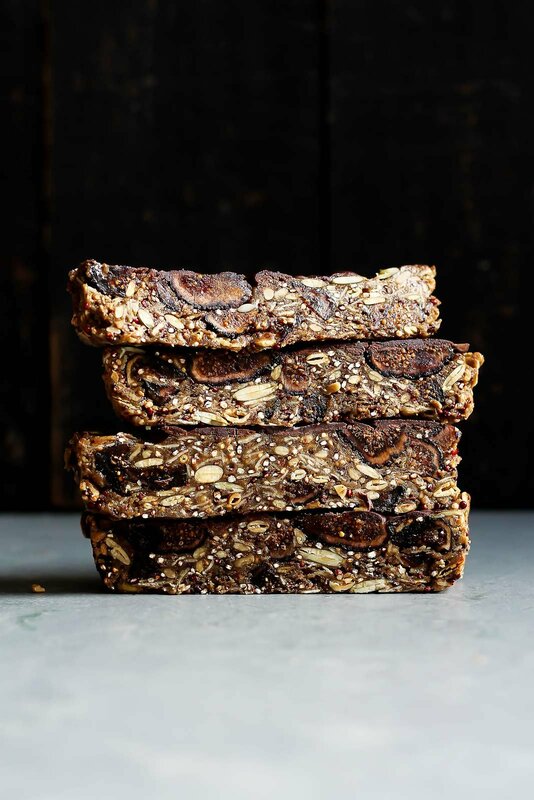 Superfood nut free granola bars made with toasted quinoa, oats, dried figs, sunflower seeds, pumpkin seeds, flaxseed and chia! A drizzle of dark chocolate on top makes them extra special. Next melt chocolate chips for 20 seconds in the microwave or over low heat in a saucepan on the stove top. Drizzle over bars. Place pan in freezer for 5-10 minutes or until mixture has hardened. 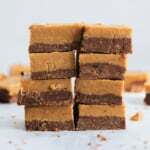 Remove bars from pan and cut into 10 bars. Store bars in the fridge. Enjoy! If you're not allergic to nuts, feel free to also sub out the seeds for any kind of nut you desire. Same goes with the nut butter! Instead of dried figs, try another dried fruits such as cranberries or blueberries. You can skip the chocolate drizzle if you want, but who doesn't love a little dark chocolate? Seriously. Wellness Wednesday: Why I no longer count calories Weekend Favorites 9.16.16 // We’re Officially Homeowners! 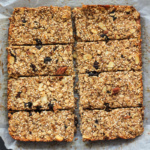 91 Responses to "Toasted Quinoa, Dried Fig & Dark Chocolate Nut Free Granola Bars"
This is exactly what I call an ideal breakfast for office days ! And your photos : absolutely amazing ! Bravo. Keep on rocking ! Made them twice, and they are delectable!! Can the bars be frozen? Not at all. Feel free to rinse the quinoa — you’ll be toasting it anyway in the oven so it shouldn’t matter! Great question. soft and chewy are the best! plus, i’m a serial eat on the go breakfast person, so no crumbs to clean up on my clothes afterwards! This looks so amazing! I wish I can grab them off my screen! What can I use instead of sunflower butter? Hi Jessica! You can use any natural nut butter you’d like if you aren’t allergic to nuts! I made these last night – they are so very very good! I followed the recipe exactly, with the exception of adding some dates because I didn’t have enough figs on hand. I think next time I make them, I might even play around with the flavors & dried fruits – so many possibilities. These would easily run about $6 for a box of four at the store, but they are incredibly easy to make at home. Thanks for such a great recipe! oh my, these were great, thanks for the great recipe! I edited/swapped: 1/2 cup of almond butter instead of the sunflower butter, I did 1/4 cup of honey and it was plenty sweet enough and I added 1 big tablespoon of tahini sauce, and finally I did not have faxmeal so I did not add that. I did the chocolate dizzle on top, this is a keeper! Is cutting up the dried figs recommended or just add them as is from the package. Wondering how to spread the chiewiness around. You should cut the dried figs — it says above! 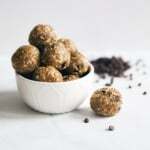 Judging by the fact that my toddler kept grabbing bites of the mix as we were mixing these together and yelling “yummy!” each time, I feel like it’s safe to say these are a hit! And he hasn’t even tried the finished product! These were really simple to put together and are easily the best granola bars I’ve ever made. Thank you for the great, wholesome recipe! I made these and followed the directions pretty much exactly and for some reason the batter is not staying together. I added more sunflower seed butter (until my jar is empty) and it’s still not setting. I’m not sure what went wrong. I may try adding some tahini a 1/4 cup at a time to see if they will set. I hope they do because the mix tastes great and these will be great to bring to my boys nut-free school. STOP ADDING MORE SUNFLOWER SEED BUTTER! Adding more of the “liquid” ingredients, in this case sunflower seed butter (or tahini) will not help your bars to set. Definitely do *not* add any tahini, since that tends to be more liquid than other butters. In fact, it will keep your bars from setting at *all. * Stop adding ingredients that function as liquids if you want them to set! Add some more oats, or flax meal–you need to add more solid ingredients to the mix in order to get the bars to set up. It will help to grind up your oatmeal in a food processor, to create an oat flour, since you need something to soak up all the extra liquid you added in the form of sunflower butter. If you just want to add more seeds, then grind them up into powder–*not* until they turn into paste, but into a thick seed meal. I just made these wonderful bars. I substituted dried cranberries for the figs and aside from this, followed the recipe exactly. They are perfect and you are right, the little bit of dark chocolate drizzle just adds a little extra to the bars. Thank you for the recipe. I will certainly make them again. Oh, yummeroonies! These are fantastic! Thank you for the recipe! Even though I have two picky eaters at home, they will eat them! Hallelujah! I didn’t have figs, so I used dates. And I didn’t have flax seeds, so I used hemp seeds. Turned out perfectly 🙂 Thank you again! They are one of my favorites! Thank you for making them and taking the time to leave a comment! Thank you so much for this recipe! Made them twice, and love them. I have a nut free household (due to an allergy), and everyone loves these! I found some allergen free seeds online (lots of the ones in the grocery store are cross contaminated with nuts in production), so we have plenty to keep making these as needed! Super simple and easy. Your bars look delicious! They are my plan for a good weekend. How long do they stay fresh? Do you put them in the fridge after freezing them? They stay fresh for a week in the fridge! 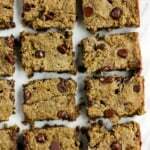 Hi there — as a mom of a child with a peanut allergy, I love seeing nut-free recipes. But it is vitally important to note that bulk dry ingredients are usually not safe for nut-allergic people. Be sure to read all ingredient labels carefully — figs and chocolate often carry nut warnings on them. Mine fell apart a little when I cut them. Did not look quite as beautiful as the picture!! Suggestions for next time? Otherwise love them. Can i sub honey with maple syrup? I hope so as I don’t have enough honey so will throw in some pure maple syrup. These came out awesome. I couldn’t find sunflower butter so I used almond butter. Also couldn’t find the pumpkin seeds so I used almonds (no nut allergy here). So good, healthy & filling. Thank you so much for sharing. Happy lady from Rhode Island. I was excited to try these and got all started and for some strange reason didn’t have quinoa. 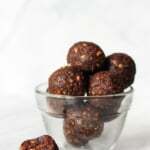 Because my mouth was already watering over these I made with hemp seed instead and added cocao nibs. So delish!! I just made these and they are delicious. I substituted dates for the figs, because we love dates, and that made them just sweet enough. Perfect for a quick ski snack. How would you suggest storing these, and for how long? Are they freezable? Thanks! I made these today and sadly, they just crumbled like granola after I pulled them out of the freezer. I wonder where I went wrong. Any tips? That said…I’m totally excited to have amazing tasting granola now! I LOVE how easy this is to make substitutions! I was out of a few of the ingredients so I added chopped raw almonds, cacao nibs, and used almond butter. So good! Oh, and I added prunes instead of the figs. Looks like a great recipe! Will it work if I sub in maple syrup instead of honey? Thanks! Nothing against flax seed meal but I have a ton of hazelnut meal in my freezer already. Do you think I could substitute that? Or would it be too greasy? Hi Mitzi – I think hazelnut meal should work! Do you think you could substitute crushed hemp seeds for the flax seed meal? I think so if you put the hemp seeds through a food processor! I love these just as the recipe calls for. Maybe I will try some other things in it when my digs are gone. So so good! Made these today exactly as recipe states except subbed dates for figs as that’s what I had. They took a lot of muscle to cut after pulling from freezer…they were only in there about half an hr. A lot of the chocolate drizzle fell off during cutting…but lemme tell ya…..Super delicious! Like OMG delicious! Picky kids asked for seconds. Excellent snack for nut-free school lunches. Thank you!! Will definitely make again and again and play with other subs. I”m so glad these were kiddo-approved! And yes, great for nut-free school lunches. Oh my goodness!! I just made these and had one for an afternoon snack – I am in love!! They are so perfect! Thank you for sharing this delicious recipe!! I had dried cranberries on hand, so I used them instead of figs, but, WOW! Amazingly good!! These are one of my absolute favorites! Glad you enjoyed 🙂 and dried cranberries are perfect! I also had the problem of them crumbling. They were still really tasty but wondering if I did something wrong. The sunflower seed butter and honey didn’t end up being very creamy so that could have been it. I’m gonna try again with a bit more butter and honey. Either way they were great! I make a 5 ingredient granola bar from the minimalist baker (https://minimalistbaker.com/healthy-5-ingredient-granola-bars/) and had problems with it crumbling initially- When I put it in the loaf pan I top with a piece of baking paper and press down really firmly with the heel of my hand- that tends to help a lot. I really want to try these but flax doesn’t agree with me. What can I use as a sub for the flax and chia? You could try using almond meal and leaving the chia seeds out! I’ve been supplying her with them since she’s stuck in bed after foot surgery and can’t get around. Amazing! So happy to hear that. We can definitely name these “crack” bars haha. I’m glad she’s getting a good treat while she heals up! Hi Melissa! Maple syrup should work in here 🙂 Enjoy! I decided to make a double batch of these today per the recipe and they are pretty tasty. My son is a fan as well. We made them with figs this time and were ok, but I like the suggestion of using other dried fruits. I’m considering mango and cranberry with the chocolate chip inside the mix instead of melting and drizzling for speed and one less thing to wash. 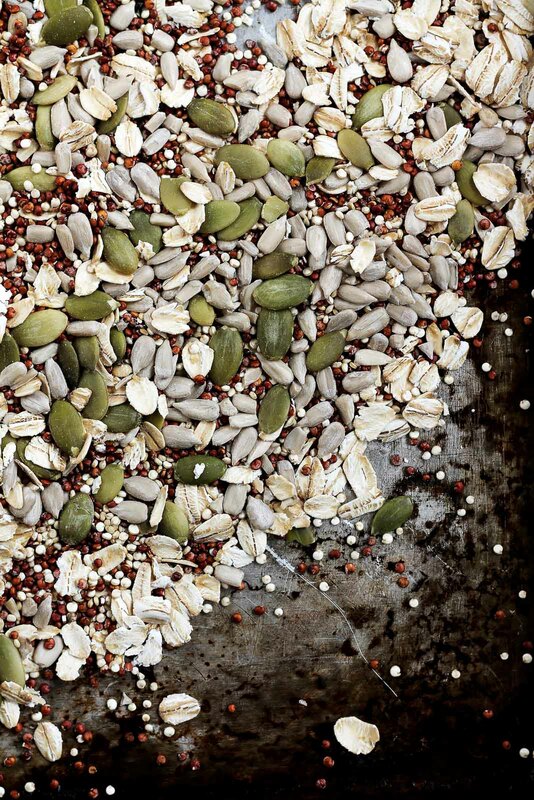 I can’t get quinoa past my kids… do you think puffed rice or millet would work ? These were delicious but the quinoa overpowered them. It was like crunching on gravel. What can I use besides quinoa next time. I can’t use nut butter due to allergies at school and wouldn’t really use sunflower butter apart from this recipe. What could I use instead? Sorry to hear you didn’t like them! You can reduce the amount of quinoa or you could probably sub oats. Can you freeze them once finished and thaw them later? I wouldn’t recommend it – the bars will crumble. Should these come out crunchier or chewier? I froze mine and then cut them, and while they taste great, they crumbled a bunch when cutting them, but are very crunchy. Perhaps I toasted my oats too long or left them in tbe freezer too long? It sounds like they might have been in the freezer too long! Yum! These were so easy and delicious. I left out the quinoa (raw quinoa makes me sick. Weird, I know.) Instead I added chopped, roasted hazelnuts. Oh wow, they were perfect!! Also, for the chocolate topping I melted 2 T coconut oil and added 2 T raw cacao powder, a dash of pure maple syrup, and vanilla to taste. It sets up just like chocolate! 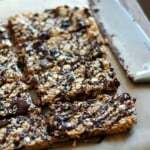 I use it all the time on healthy brownies and bars. On ice cream it hardens just like magic shell. Delicious!! Can you come up with a way to make this without oats? I am allergic to oats, wheat, and corn. I’ve only made the recipe this way, but feel free to try any of these delicious snacks!